Ideally located in Montfavet, 5 km (3 miles) from the centre of Avignon, the Montfavet la Cristole offers cosy accommodation, free Wi-Fi and a warm welcome. Famous for its lovingly preserved natural surroundings, splendid sunny climate and history-laden stones, the Vaucluse department is the true heart of the Provence region. Guestrooms at the Campanile Avignon Sud - Montfavet la Cristole are contemporary in style and provide you with a comfortable living space. 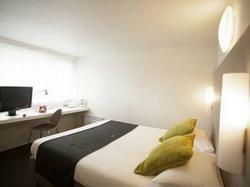 They are all equipped with modern en suite facilities, air conditioning and a TV. The Cristole boasts an ideal location to discover this fascinating city and take in the unique atmosphere of the region. The hotel's managers and staff are dedicated to making your stay both enjoyable and memorable. Reception is open from 6.30 am till 11.00 pm. Avignon is at the crossroads of the Provence and Languedoc regions and offers an outstanding cultural heritage. The famous Pont Avignon and Popes Palace have been ranked as World Heritage Sites by UNESCO and the city was awarded the title of European City of Culture in 2000 for its theatre festival and historical and cultural heritage. - Take the N7 towards Aéroport/A7. - The hotel is on the right-hand side, Clos de la Cristole. - Take the N7 towards Avignon. Breakfast is served from 06:30 to 09:00 Monday to Friday, and from 07:00 to 10:00 on Saturday, Sunday and public holidays. Reception is open from 06:30 to 23:00. If you plan to arrive outside these hours please ensure you bring the credit card used to make the reservation. You will need this card to use the automated check-in system.